Using a CMMS without the nested PM feature would mean that you would have to create 3 scheduled maintenance items and then line them up so they triggered on the same day. This would then have resulted in three work orders being created, adding to your paperwork pile. This strategy works fine when you only have a few assets or tasks, but quickly becomes very complex when dealing with a large number of assets. What is a nested PM? The nested PM feature is unique to Fiix. It lets you group PMs of different length and complexity together when they are due to occur at the same time. By nesting your PMs together, you only have one single PM to manage. 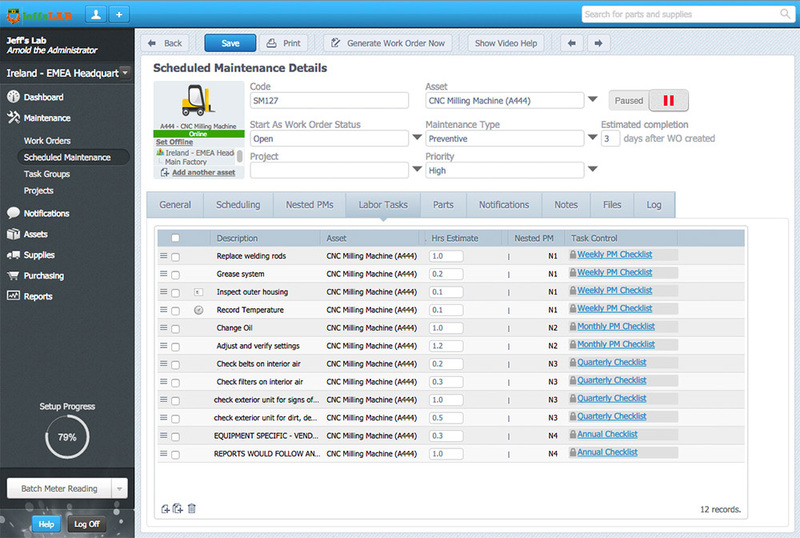 The nested PMs determine which tasks are released to the work order based on the schedule. In the monthly/annual example above, the monthly and annual PMs can be grouped into a single PM. When the monthly PM is due, the nested PM only releases the monthly takes. Similarly, when the annual PM is due, the nested PM will release both the monthly and annual tasks. Nested PM functionality assumes the organization includes all activities and tasks from more frequent cycles into less frequent cycles. For example, monthly tasks are included in every annual PM. How do Nested PMs work? When setting up nesting PMs, each PM activity is considered a multiplier of the lowest PM cycle. Let’s take a look at a time based PM example. In this example, the weekly PM is the shortest PM cycle so it has a nesting code of N1, which is our root PM. The weekly cycle becomes the basis on which all other PMs are built on. As there are 52 weeks in a year, the annual PM has a multiplier of 52. In this example, the 250 hour PM is the N1 root PM. Everything else becomes a multiplier of that. Its simple math! How can I access nested PM functionality in my CMMS? The new nested PM feature comes standard with the enterprise package CMMS. 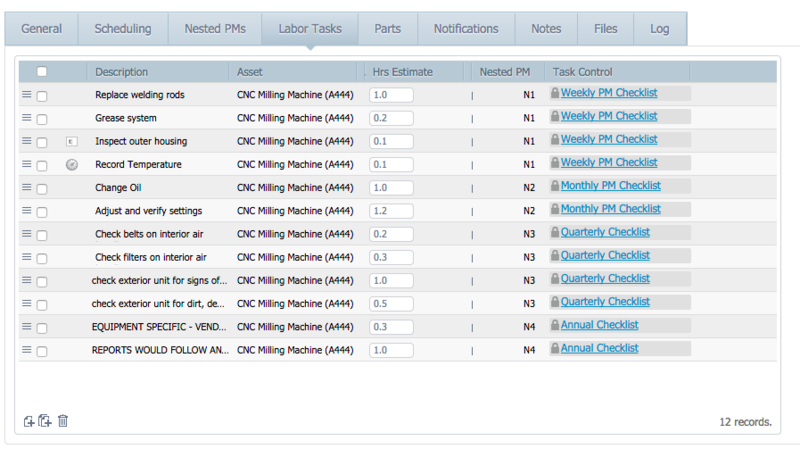 If you already have the enterprise CMMS, you’ll notice the new nested PM tab on your scheduled maintenance. Not every PM is a nested PM so you can ignore the nested PM tab if you are building a traditional, non-nested PM. 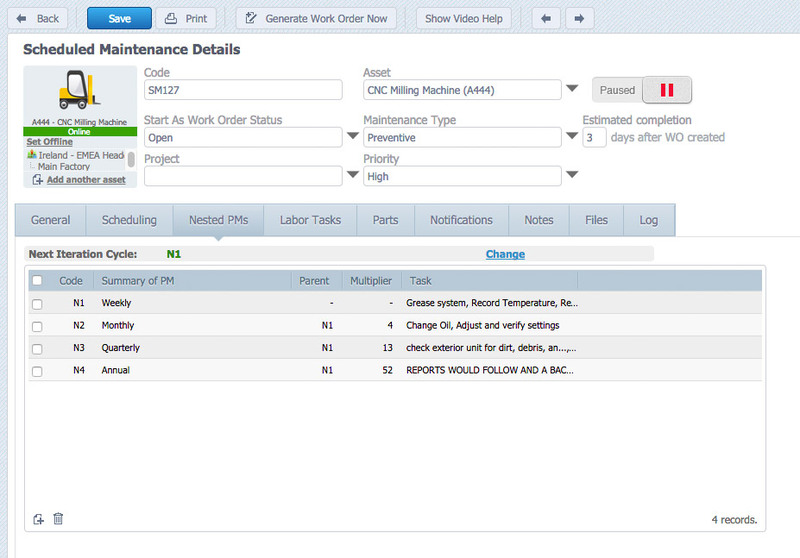 If you don’t have the enterprise CMMS, you can upgrade today in your CMMS by clicking the green upgrade button. Upgrading will also unlock some other great enterprise features such as rotating assets, reports writer, multi-site and our API. If you follow the 10% rule of maintenance, then you must set your due date to 10% of the root cycle. If you don’t, the more frequent PM’s may be late. For example, lets say you nest the monthly and quarterly together, and complete the quarterly PM 8 days after due, the quarterly PM obeys the 10% rule, but the monthly tasks are 5 days late. What happens when the intervals don’t line up? For example, you complete a weekly PM every 7 days and a monthly PM every month on the 1st. It is not possible to line up a weekly with a monthly when calendar months can be 28 – 31 days. To resolve this, you adjust your monthly interval to 28 days and the two PMs will line up easily.